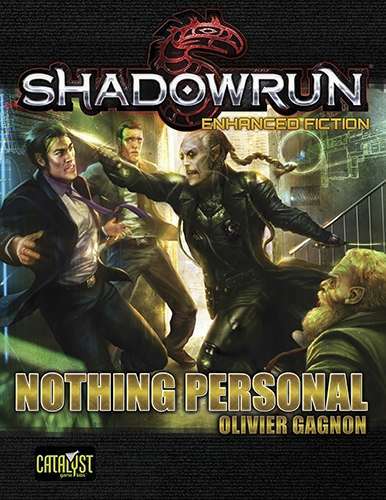 We talk about his newest work Nothing Personal an Enhanced Fiction product as well as some of his contributions to the Shadowrun world such as. This entry was posted in Podcast Episodes and tagged 2074, 5th Edition, Blade Runner, Catalyst Demo Team, Catalyst Game Lab, convention, Drone, Enhanced Fiction, Facebook, fiction, Missions, Nothing Personal, podcast, Riggers, RPG, Shadowrun, Shadowrun Misions, Vladivostok Gauntlet by Tim Patrick. Bookmark the permalink. I want to thank Tim Patrick and his co-hosts for taking Mr. Gannon to task for the lack of Shadowrun jargon. I’m not sure how many Catalyst officers read these reviews, but I have heard several mention that they listen to the podcast. I agreed with Tim almost word for word. I really enjoyed the new point of perspective. But in my opinion, these new books that abandoned the use of Shadowrun’s stylized jargon are simply cyberpunk. Don’t get me wrong. I’m not afraid of cursing. Probably do it more than I should. But, they obviously water down the history of the setting and sew confusion if new followers search out the older fiction. I say if you want to write Shadowrun fiction, then write it for Shadowrun. If you don’t like the what makes it different then write for generic cyberpunk. Don’t degrade this histiry. Thank you, again, to the staff of Critical Glitch Podcast.